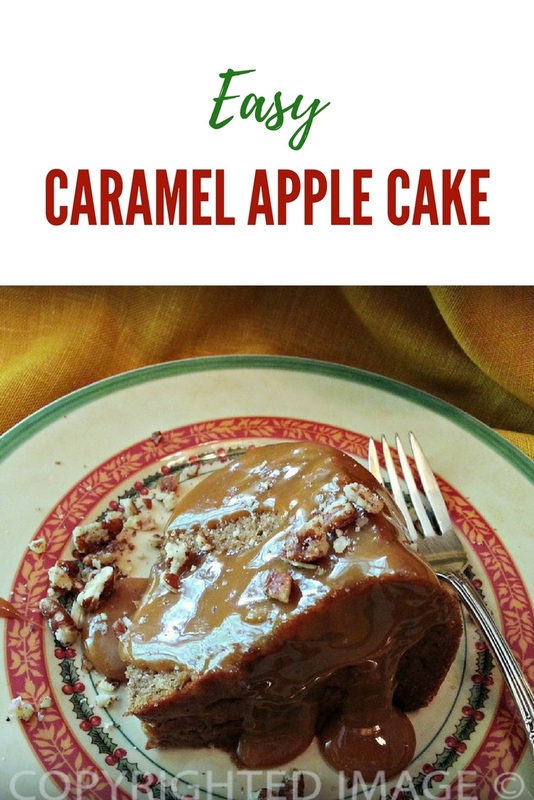 This Easy Caramel Apple Cake Recipe is quick to prepare. Prefer cupcakes? Cupcakes are not only fun to make but there are so many ways to dress them for the dessert table. This dessert started as an apple caramel cupcakes recipe! Last week, I ordered another cookbook from Susanne’s collection of cookbooks. How can anyone resist a title like Just Dessert Recipes promising, in the title, that moms could make quick after dinner treats? Break out your E-Reader There are so many scrumptious desserts in her virtual cookbook! Have you heard about the Hillbilly Housewife? One of us loves spice cake and the other loves caramel so it’s a piece of cake to select this recipe > Apple Caramel Cupcakes. The problem is the cupcake pan is missing so I made a Bundt cake but why not make individual, perfect portion Bundt shaped cupcake molds or mini cake pans? I can truthfully say that the most time-consuming aspect of this recipe was the time spent removing the cellophane wrappers from the caramels. These were individually wrapped caramels. Moral of the story is never send the DH to the store with a request to purchase 35 caramels. I received multiple calls related to desperately seeking candy. 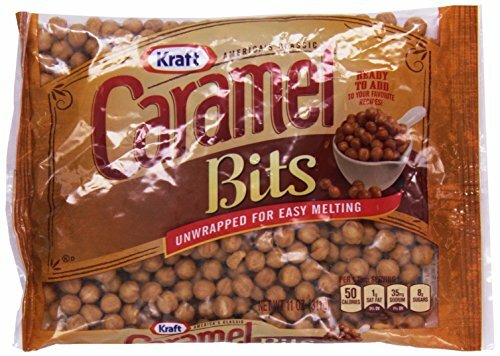 Men (well…some of them) never think to look in the baking aisle where they might find Kraft Caramel Bits®… unwrapped and perfectly sized for quick melting. 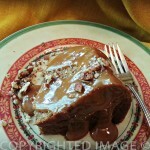 Cooks – try not to eat the caramel sauce before you use it on the cake. 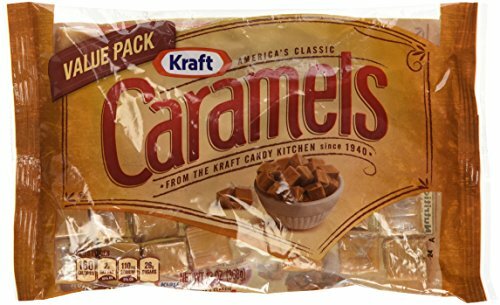 I am proud to say that soft and chewy caramel is my favorite candy regardless of the brand and regardless of its state. Melted is fine with me. 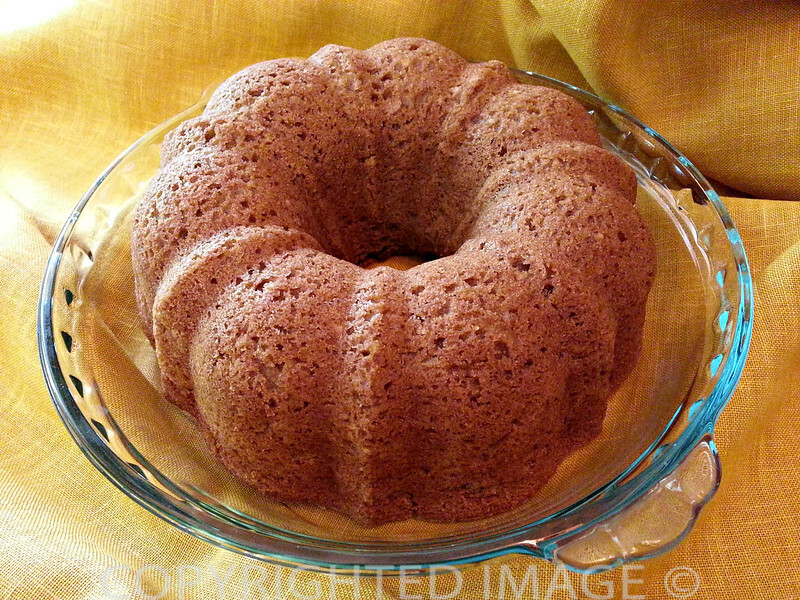 I used a hand held mixer to prepare the Duncan Hines® Signature Spice Cake mix and made the cake using a single bowl, following the recipe on the back of the box. Instead of chopping the apple, I shredded it so the pieces would distribute a little more evenly across the batter. Fall is the time of year when I begin to stash all types of nuts for baking. But I could not find the small quantity of peanuts called for in the recipe. I had a bag of pecans halves (I keep a stash handy for my sticky buns recipe). Crushed pecans are just as tasty as chopped peanuts! Now if your plans include making a batch of candied apples, all natural roasted peanuts are available in larger “bulk” quantities. These unsalted peanuts chopped peanuts are perfect for baking purposes and to top ice cream desserts. In baked goods, apples can produce very different results. This article about apple varieties details which apples are perfect for pies and baking in general. There are times when you want to dice the apples (I cut mine into 1/2 inch squares) because they will be thoroughly cooked by the time a dense cake is baked. You can also chop the apple into smaller pieces – I often shred them using a boxed shredder/grater or a coarse grater – both handy kitchen tools! Why did I not use the 1 1/3 cups of water specified in the recipe? I figured the shredded apple would render enough juice while baking to make up for close to 1/3 cup of liquid. I was also considering the size of the eggs in the fridge – Kreher’s® Super Jumbo eggs – which are considerably larger than the typical large eggs. Always wear cut resistant gloves when slicing, shredding and grating foods! All boxed cake mixes should taste like this! Easy Caramel Apple Cake has moist spice cake as it’s basic ingredient. Add a tart shredded apple and pecan bits then top with a decadent caramel sauce. Serve warm for the most compliments…. Don’t bother bringing out the cake safe. Spray a Bundt pan with baking spray. No matter how decorative the Bundt pan, tt works wonders in any kind of pan – from the individual muffin size or the large decorative pans. In a small bowl, shred the apple into large shreds and sprinkle with a little lemon juice. Set aside while you prepare the batter. Place the pecan bits in a small zip lock bag. Toss with 1 tablespoon of flour. Set aside. In a large bowl, add the eggs, the oil and the water. Stir to combine then add the cake mix. Beat on the lowest setting to incorporate slowly into the liquids and eggs. Once well combined, raise the setting on the mixer to 2 or 3 and beat the batter for a couple minutes more. Fold in the shredded apple and then the pecan bits making sure to distribute evenly. Pour evenly into the Bundt pan then tap the pan to distribute the batter and release any air bubbles. Cook according to box directions – 30 to 35 minutes. At 30 minutes, I use a cake tester to check the cake to make sure the center was cooked. When done, remove from the oven and cool on a rack for about 10 minutes then invert onto a glass platter or serving dish. I prefer to add the sauce to individual servings rather than to the entire cake. Makes it easier to cut neat slices and keep the serving dish relatively clean in case there is any cake to store for another day. For the caramel sauce, follow Suzanne’s recipe and melt the caramel candy in about 1/4 cup of sweetened evaporated milk or use Smuckers® caramel dessert topping sauce. This sauce happens to be my favorite way to top any slice of cake or scoop of ice cream. But… this one also sits in a kitchen cabinet ready to add a layer of caramel flavor to anything! Either way, it makes for a rich slice of cake. Stock the pantry with Kraft Caramel Bits®. There are many uses for these goodies and they are absolutely perfect for the Easy Caramel Apple Cake Recipe! End result? You can see how scrumptious the finished bundt cake looks. It is dense but moist with bits of apple. Of course, I simply had to taste test it as soon as the picture was taken – the cake was still slightly warm and so was the caramel sauce. 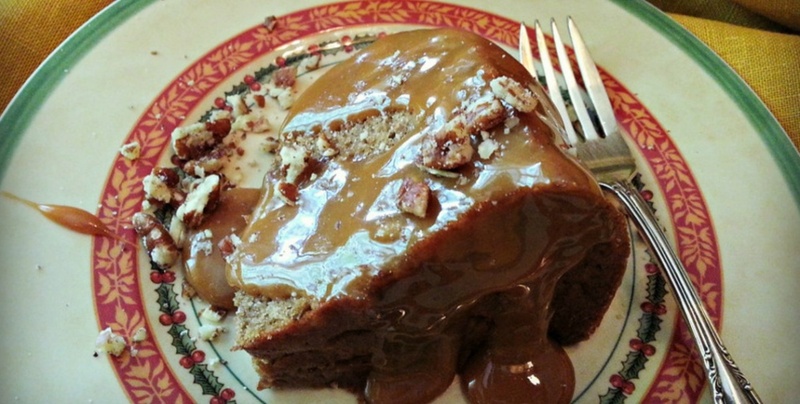 Let’s all thank Susanne for a scrumptious Easy Caramel Apple Cake Recipe!